One touch printing from smartphones is on the way with the new Samsung Xpress series of NFC printers. The range includes the C410W colour laser printer, the C460W with print, copy and scan functionality and the C460FW with added fax capability. All three models are able to print up to 18 pages per minute in black and white and four in colour. NFC can be used to print photos, documents, e-mails and web content by tapping an NFC phone to the printer, while contacts can also be synced to ease faxing. 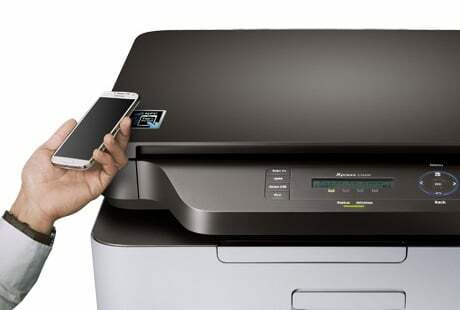 The system uses a NFC to initiate a connection between a mobile device and the printer and prompt new users to download a Samsung Mobile Print app, and WiFi or WiFi Direct to transfer data. Samsung’s printing solutions business R&D team principal engineer Dongchae Park adds: “We decided to make tap to print work for most smartphones on Android 4.0 or higher. That was a big challenge for us as it required compatibility with any Android mobile device from anywhere in the world. Users can also use the Samsung Mobile Print app to send content from their smartphones over the air while the Xpress series also supports Google Cloud Print for printing over the web from anywhere. The printers launch in Korea at the end of June 2013 and will be available in the USA and Europe from July.